I know what you are thinking. “Holy crap! She posted something that wasn’t covered in butter and/or sugar!” It’s true. My site has been a little bit heavy on the carbs. Surprisingly, I eat other things though, like vegetables!! It wasn’t always that way, though. Back in the day, I would pretty much only eat canned, Green Giant corn niblets and canned Green Giant green beans. That’s it. I wouldn’t eat another name brand and I wouldn’t eat anything that was frozen. Green Giant. Canned. Corn. Green beans. The end. Then I went to college. You would think that my taste would have expanded being away from the comforts of home. They didn’t. Unfortunately, though, my parents’ did. I remember coming home one time and being served fresh asparagus. “Um…excuse me? This is not what you have been serving me for the past 10 years. What is going on here? ?” When I stopped wrinkling my nose in distrust and tried them, the asparagus ended up being delicious. It’s still one of my favorite vegetables. I hate when my parents are right. Anyway, It’s pretty appropriate that my first veggy recipe on wickedvegan.com is my old buddy, Green Bean. They are no longer canned but I am pleased to say that they are even better than I remember the Green Giant kind being! 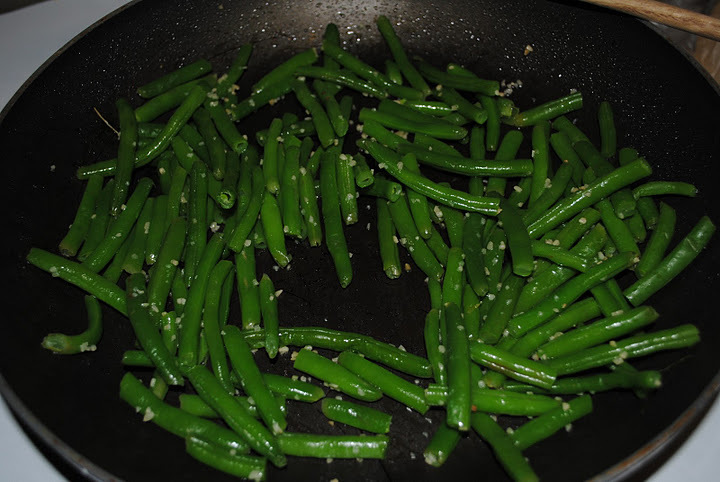 In a large sauce pan, steam green beans until crisp, about 5 minutes. Drain in a colander. 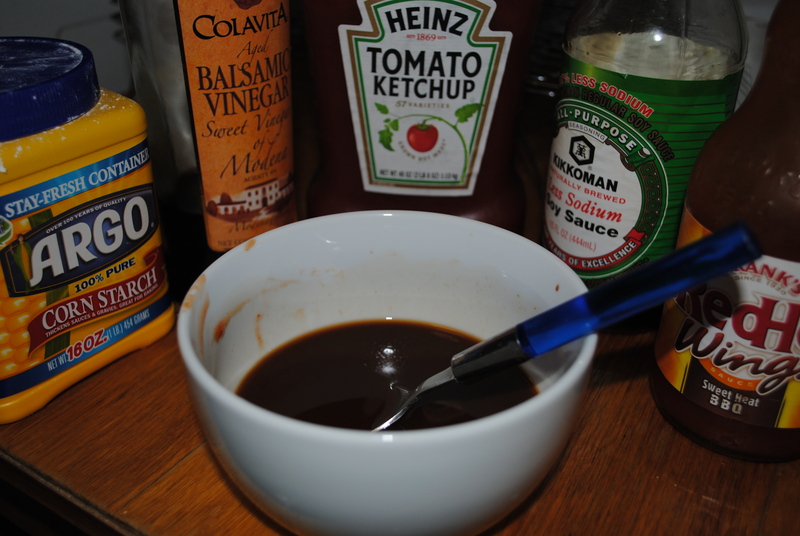 Meanwhile, in a small bowl, combine soy sauce, ketchup, vinegar, dissolved cornstarch and pepper sauce. Spray a large nonstick skillet with cooking spray; heat. Stir-fry green beans and garlic 2 minutes; add soy sauce mixture and cook, stirring, until thickened, about 2 minutes longer. 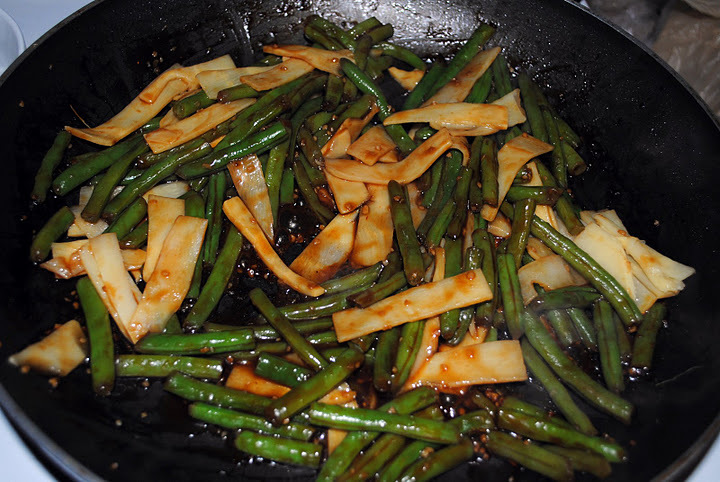 Stir in bamboo shoots and sesame oil; serve at once. *this recipe is incredibly versatile. I don’t think I’ve made it the same way twice. This time, I didn’t have red wine vinegar so substituted balsamic vinegar. I also didn’t have sesame oil and really didn’t want to add anymore oil to the recipe so I sprinkled sesame seeds on instead. This also goes together really quickly. 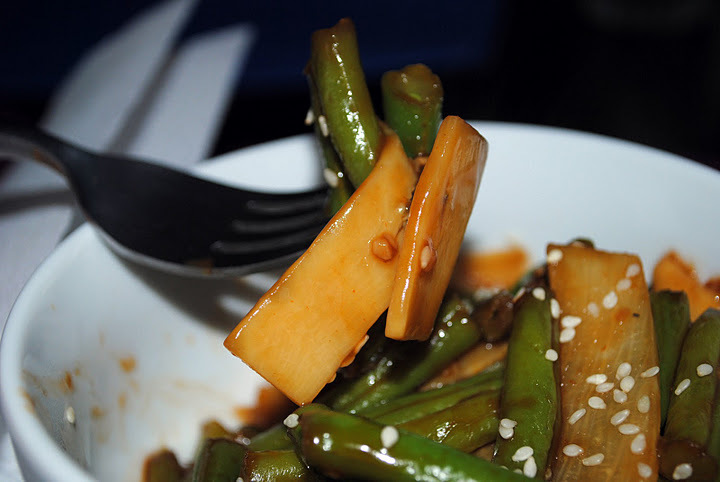 Not sure what to serve with random green beans and bamboo shoots? If you’re cool like me, you’d have just this for dinner, with a hand full of raw almonds, on your way to a second job. If you prefer sitting down at dinner and actually eating a full meal, then come back Friday. I’ll have yummy Ginger Lime Noodles!